TPA Portable Roadways has firmly established itself as the trusted supplier of temporary roadways across the UK and Europe, providing reliable equipment hire and first class installations delivered by our teams of industry experts. TPA Rapid Rail Access is firmly established in the rail sector as the principle provider of safe, effective, value for money access systems. 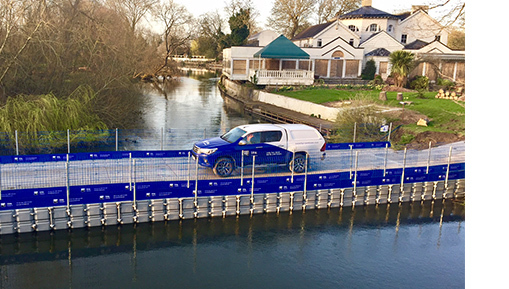 TPA Pontoons is a hire provider of both plastic and steel modular floating pontoons for a diverse range of installations across an array of industry sectors. TPA collaborate closely with our clients to create tailored solutions in the Electricity Transmissions field. TPA provides the UK’s most complete range of temporary rail site access equipment, enabling safe passage for vehicles, plant and pedestrians over land, water and on/off track. TPA remain one of the leading suppliers of temporary hire equipment and access solutions in Europe. At TPA, we’ve positioned ourselves at the forefront of the construction sector in the UK and Europe. TPA boast a diverse array of equipment that can transform imaginative event concepts into practical realities. TPA facilitate the marine sector across the UK, working with you to ensure your projects are completed to spec and on-time. TPA Portable Roadways has experienced significant growth to become a trusted supplier of temporary roadways across Europe & the UK, providing unrivalled equipment hire & first class installations. TPA Rapid Rail Access is firmly established in the rail sector as the principle provider of safe, effective, value for money access systems. Providing nationwide hire of specialist Road Rail Access Points (RRAPs) designed, approved and dedicated for use in the rail sector. TPA Pontoons is a hire provider of both plastic and steel modular floating pontoons for a diverse range of installations across an array of industry sectors. TPA has the experience, people and equipment to deliver the temporary installation you need, covering the whole of the UK, ensuring that you deliver your project on time and to budget.